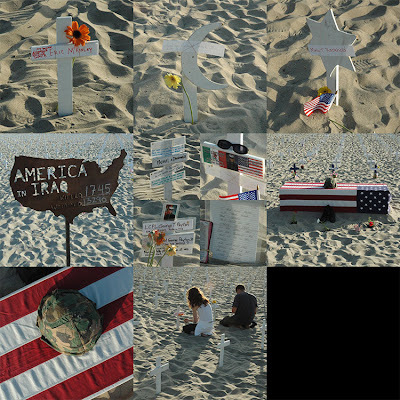 On July 3rd, 2005, my family and I visited the Santa Monica Beach, where the Arlington West war memorial, a project of Veterans for Peace, is on display every Sunday, a sad, respectful memorial to the American troops who have fallen in Iraq. It was a somber and sobering place. Many, many of the markers had personal tokens and remembrances which had been carefully preserved by the people responsible for the memorial. Many more had fresh flowers or recent additions, showing the importance of the memorial to the loved ones of the soldiers. When I returned home, I felt driven to create this montage as my own memorialization. I knew that it wasn't a montage I was likely to sell copies of. Nobody wants death in their living room. But, at one point, it was on display for several months in a Unitarian fellowship. As you can see from the image, the death toll at the time was 1,745. It is now well over 4,000. That doesn't count the non-military workers, coalition forces, journalists, or suicides. And then there are more than 60,000 wounded. And all those numbers are dwarfed by the estimated million Iraqis who have died. The warmongers in the White House would like to paint those against the war as "with the terrorists" or "against America." They believe that we have no right to disagree and that even the decorated veterans who sponsor something like Arlington West are dishonoring our armed forces. They are wrong. We can remember and honor all the brave men and women who have sworn to defend this country, including those who have made the ultimate sacrifice, while at the same time disagreeing with the administration that started this illegal, unnecessary, and shameful war and sent our troops into harm's way. To truly honor them, we must ensure that their sacrifices are not vain. Recently, President Bush told us that he's sacrificed too -- he's given up golf for the war. Now, he has asked for a moment of remembrance this Monday on Memorial Day. He announced that Major League Baseball games will pause and that the National Memorial Day parade will halt at 3PM, local time. How about a pause in the war? To the veterans: Thank you for your service. To the families: Thank you for your sacrifice. To the administration: It's been five years. Bring our troops home. Note: I will loan a copy of this piece to appropriate groups for display purposes. I will also sell copies of this piece at my cost to non-profit groups. All profits from any other sales are donated to peace organizations. Please contact me if you are interested in using this piece in any way.